Sweat to a new YOU! NOW OFFERING UNLIMITED MONTHLY PACKAGES!! Infrared light (experienced as heat) is the invisible part of the sun’s spectrum with the ability to penetrate human tissue to produce a host of health benefits. It is naturally occurring from the sun and is the basis for all Sunlighten™ saunas. Because infrared sauna therapy heats the body directly rather than simply warming the air, it raises the core body temperature and produces a deep, detoxifying sweat at the cellular level, where most toxins reside. Far infrared also aids in blood pressure reduction & weight loss, burning up to 600 calories in one 40 minute session! Now learn about some of the possible benefits! Weight loss: As said above a 40 minute session can burn up to 600 calories. With regular sauna use a person is able to lose up to 10 pounds in 30 days. During these session the infrared sauna heats your core temperature so your body has to work harder to cool your core temperature. During this process you heart rate increases, along with your cardiac output and metabolic rate which helps you burn more calories and in turn lose more weight. With regular sauna use you are able to sweat the pounds away without any special diet or exercise regimen. Detoxification: This is a very important step to the strength of your body’s immune system. It helps the body’s biochemical processes function efficiently so that we are better at digesting the nutrients in our food. Detoxification has also been shower to help with chronic fatigue, fibromyalgia, immune deficiency states, auto-immune diseases as well as ADD, ADHD and autism. The United States Center for Disease Control estimates that the root causes of more than 80% of all illnesses are found in personal environments or lifestyles. In other words, the world around you can make you sick. It’s in the air we breathe, and in the food we eat. There’s very little we can do to reduce exposure. We can, however, use sauna detox as a treatment. Sweat the small stuff in a Sunlighten infrared sauna, and sweat yourself to better health and wellness. It is said that Infrared saunas are SEVEN times more effective than a traditional sauna! Relaxation: The American Institute of Stress estimates that 75% to 90% of all visit to primary care physicians are from stress-related problems. Long-term stress is the cause of countless physiological effects on the body, including increased blood pressure, weight gain and weakening of the immune system. 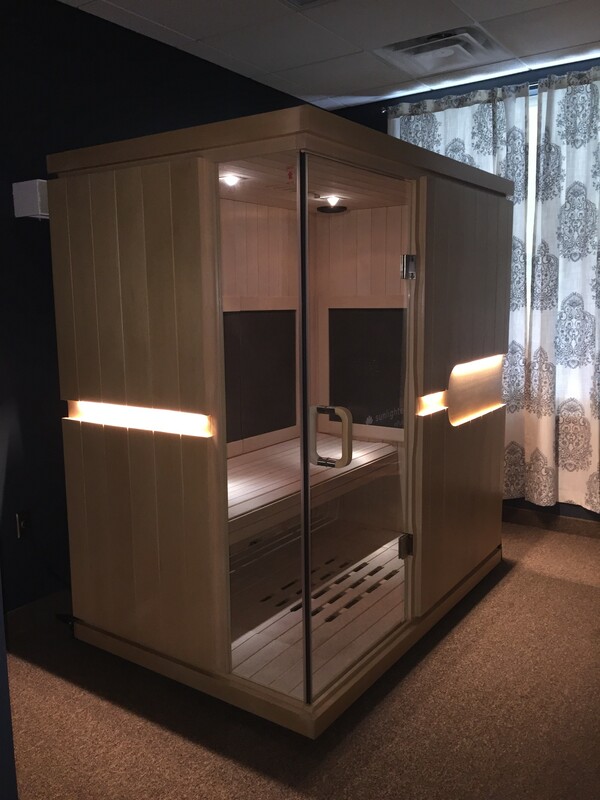 Sunlighten Saunas deliver the most therapeutic infrared sauna heat per square inch. This is up to 99% efficient! This helps you envelope in soothing warmth to help you relieve stress, ease your muscles causing you to fully relax. The infrared heat are guaranteed to invigorate deep tissue sweat that will help you feel completely refreshed when you walk out! Reduction of Blood Pressure: In the U.S. alone, one and three adults suffer from heart disease, stroke or some other form of cardiovascular disease in their lifetime. High blood pressure increase your risk of getting kidney disease, heart disease or serious stroke. Sunlighten saunas have been clinically determined to provide one of the best and natural ways to lower your blood pressure with each session. Studies were done which concluded that Sunlighten Infrared Sauna therapy dilated blood vessels and reduced the volume of their inner lining , thus increasing circulation to promote healthy blood pressure. Improve Circulation: A cardio workout has never been so relaxing! While you sit in the Sunlighten sauna your body is being heated from the inside which increase your blood flow. Regular infrared sauna use-especially in the mid-infrared range has been shown to significantly stimulate blood flow even after your session has ended. The infrared heat waves heats your muscles and increases blood flow in the a similar form as a cardio workout. Healing of Wounds: Our skin is such a vital part of our health and well-being. So when it is damaged it is important to help it heal quickly! That is where our Sunlighten Infrared sauna can come into play! Studies conducted by NASA concluded that NIR LED light significantly promotes fast cells regeneration, wound healing and human tissue growth. The studies shows human cell growth increased by 155%-171% in some cases and wound size decreased by 36%! To read more of the studies that were mentioned, as well as learn more about our Sunlighten Infrared Sauna please visit the Sunlighten website!